We were long overdue for a new vacuum, ever since we moved into a new apartment, we no longer had the central vacuum that we used to have in our house. The only thing we had were a couple vacuums that were quite old. So, when I found out that we would be reviewing the Eureka Airspeed Gold AS1001A, there was a lot of excitement. 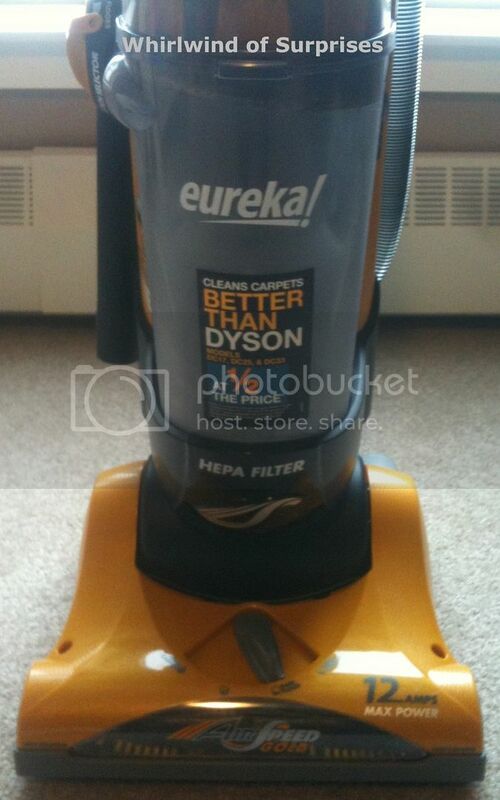 What you'll notice initially is the price of an Eureka Airspeed Vacuum. It's quite reasonably priced at $139.99. Its a rather good deal for a high powered (12 Amps) vacuum cleaner. Built with AirSpeed® Technology that have increased airflow via wide tubes for better suction. The testing crew were amazed at how much this the Airspeed AS1001AE was able to pick up. Shockingly, it felt as if the old vacuums were never doing anything at all. At 18.5lbs, it was lightweight enough so that everyone in the family were able to manuever the machine with ease. Money savers include an onboard dust bin instead of vacuum bags. The family also loved the included accessories which mounted easily and conveniently on the back of the vacuum and helped for stair and furniture cleaning. These included the tools/accessories crevice tool, upholstery and dusting brush. An extra U belt was also provided for the dust roll, which was much appreciated. The electrical cord was approximately 25ft long which made for a decent distance for covering a good sized area. If you're concerned about the noise vacuum cleaners produce, this would probably rate a medium. Not too bad but also a drastic improvement from previously when you could hear the old vacuum cleaners literally all the way from the elevators. The testing team also loved how the dust bin and hoses were clear, making it easy to see what was happening and the ability to locate any blockage if present. The only thing they weren't sure about was the machine material itself. Although it appears to be fairly durable plastic, it's hard to tell how well it'll last through the wear and tear at this point. They, however, appreciated how the hose was strengthened. The other thing is that although the Eureka uses a HEPA filter with charcoal, this will need to be replaced every 3 months or so which will cost you ~$40 each time. Bottom-line: Strong vacuum cleaner at a reasonable starting price. However, replacing filters may end up costing you. By all means, it does the job wonderfully. Only time will tell how durable it really is. Buy It: Look for the Eureka Airspeed AS1001AE in department stores near you. This model sells for $139.99. #Winners! Big #giveaways going on!